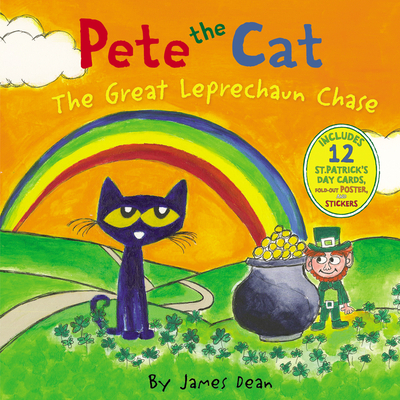 New York Times bestselling author and artist James Dean takes us on a St. Patrick's Day adventure with Pete the Cat as Pete discovers how lucky he actually is! It's St. Patrick's Day, and it's also the grand opening of Pete the Cat's leprechaun catching business. Pete gears up to trap a leprechaun for his friends! But catching a leprechaun is never easy—especially if it’s Clover, who's full of tricks. Will luck be on Pete’s side? Or will Pete learn luck is actually something earned? Pete the Cat: The Great Leprechaun Chase also comes complete with a poster, stickers, and twelve punch-out St. Patrick's Day cards.